I've been saving a special one for Christmas. Thanks to Dennis A for adding this 1967 ticket application form to the MTH collection. I needed to make Christmas right. 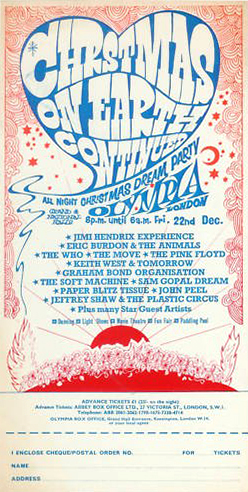 Speaking of which, here's a Christmas present for those of you who, like me, are Jimi Hendrix fans. Some rare footage of him warming up in the dressing room followed by his performance at that very Christmas On Earth Continued Party recorded on Friday 22 December 1967. Yes. Gulp. Forty-five years ago tomorrow. RIP. Thanks for keeping us so well entertained this year, and for proving that - so often - typos are difficult to spot, even when you've been told they're there. It took a good few seconds to find the one above, for instance. In my case, as well as making me chuckle, you've done wonders for my powers of observation. Happy Christmas MTH. That's very kind of you, Jon. Thank you. And thanks for all your contributions as well. Through your marvellous snippets we're learning so much about everyday life in Peterborough. And MTH just wouldn't be the same without you. Hope you have a Happy Christmas too. MTH is one of the first alerts that google reader wakes me up to each day, and I look forward to starting the day with either a wry chuckle, or an 'OMG'...happy Christmas!!! That's just brilliant to know, John. Thanks very much. And thanks for all your contributions too. Hope you have a Happy Christmas.